At least 1.3 million Florida residents are under mandatory evacuation. At least 1.3 million Florida residents are under mandatory evacuation ahead of Hurricane Irma, which is slated to strike the state as a Category 4 storm on Sunday morning. Florida Gov. Rick Scott, who declared a statewide emergency earlier this week, said additional evacuations are expected to be issued as Hurricane Irma approaches the state. Scott urged all Floridians to heed local alerts and follow the directions of local officials. "If you're told to evacuate, leave, get out quickly," the governor said at a press conference Friday morning. "This storm is wider than our entire state." Scott said people can expect major traffic in Florida as residents and visitors adhere to evacuation orders. "Please be patient," he said. "Evacuations are not convenient but they are absolutely meant to keep you safe." "I cannot stress this enough -- do not ignore evacuation orders," Scott added. "We can rebuild your home; we can't rebuild your life." Here's a roundup of the evacuation orders, transportation and shelters. Visit the Florida governor's website for the latest information. Mandatory evacuations were in effect beginning Friday for the coastal cities of South Bay, Lake Harbor, Pahokee, Moore Haven, Clewiston, Belle Glade and Canal Point. Brevard County announced mandatory evacuations for Zone A, Merritt Island, barrier islands as well as some low-lying mainland areas along Indian River Lagoon beginning Friday. Broward County issued mandatory evacuations beginning Thursday for those who live east of Federal Highway, including on the barrier islands. Charlotte County has ordered voluntary evacuations. 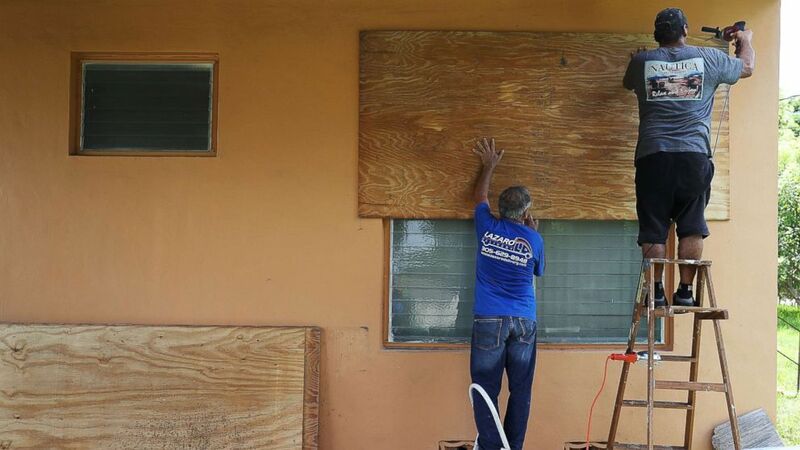 (Joe Raedle/Getty Images) People put up shutters as they prepare a family member's house for Hurricane Irma, Sept. 6, 2017, in Miami. Collier County announced mandatory evacuations beginning Friday for Goodland, Everglades City, Chokoloskee and all mobile homes. Flagler County ordered mandatory evacuations beginning Saturday for residents living in nursing homes, all varieties of assisted living facilities and community residential group homes within coastal and Intracoastal Waterway areas -- Zones A, B, C and F. Voluntary evacuations were issued Thursday for anyone who lives in a mobile home, a recreational vehicle, a trailer or a structure that could be unsafe in hurricane conditions. Glades County issued mandatory evacuations around Lake Okeechobee. Hardee County announced voluntary evacuations for residents living in mobile homes, port structures and low-lying areas. Hendry County ordered mandatory evacuations for residents living in mobile homes, recreational vehicles, non-slab-built homes, low-lying areas as well as areas near Lake Okeechobee. (Mark Wilson/Getty Images) Tourists wait to catch a shuttle to a shelter as the city announced a mandatory evacuation ahead of the approaching Hurricane Irma, Sept. 7, 2017 in Miami Beach, Florida. Indian River County issued voluntary evacuations for barrier islands and low-lying areas. Lee County ordered mandatory evacuations beginning Friday for the barrier islands of Bonita Beach, Fort Myers Beach, Sanibel, Captiva and Pine Island. Manatee County announced voluntary evacuations for Zone A.
Martin County issued mandatory evacuations beginning Saturday for manufactured homes, low-lying areas and barrier islands. Miami-Dade County ordered mandatory evacuations for all of Zone A, all of Zone B as well as parts of Zone C. Not sure which zone you're in? Click here. Monroe County announced mandatory evacuations for both residents and visitors. (Mark Wilson/Getty Images) People pack up their car to evacuate as the city prepares for Hurricane Irma, Sept. 7, 2017 in Miami Beach, Florida. Palm Beach County issued mandatory evacuations for Zone A and B, as well as voluntary evacuations for Zone C and Lake Zone E.
Pinellas County ordered mandatory evacuations for Zone A as well as all residents living in mobile homes. Sarasota County announced voluntary evacuations for Zone A as well as all residents living in mobile homes. St. Lucie County issued mandatory evacuations for north and south Hutchinson Island as well as low-lying areas. 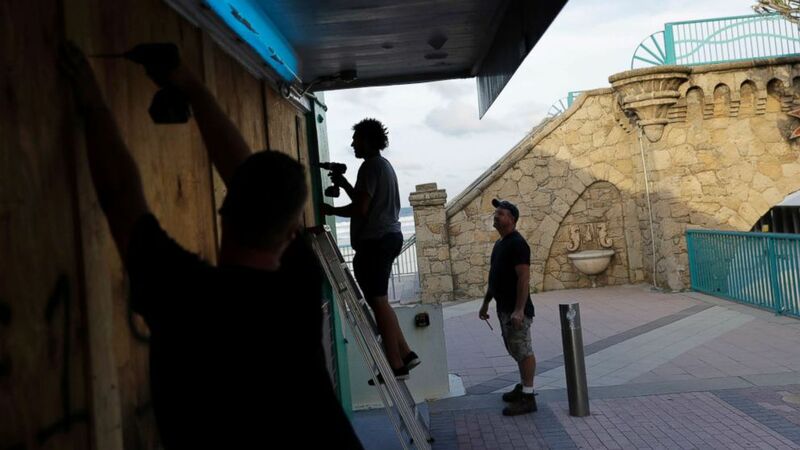 (David Goldman/AP) Ryan Otway, from right, Matthew Thames, and Spencer Taylor board up a pizza restaurant on the boardwalk ahead of Hurricane Irma in Daytona Beach, Fla., Sept. 7, 2017. South Florida officials are expanding evacuation orders as Hurricane Irma approaches, telling more than a half-million people to seek safety inland. Gov. Scott said shelters are continuously opening in coastal counties, including shelters for people with special needs, pets, and the general population. Florida is working with the American Red Cross to identify shelter capacity during and after the storm, Scott said. For a list of all open shelters, click here. For more information on shelters, road closures and evacuation routes, visit www.floridadisaster.org. School buses are available for transportation needs in Broward, Miami-Dade and Monroe counties. Miami-Dade County is currently using buses to help evacuate people with special needs, while Broward County has buses on standby. There's a dedicated transportation hotline available specifically for individuals in the Florida Keys, which can be reached at 305-517-2480. Meanwhile, major airlines will suspend operations at all South Florida airports by Friday night. Orlando International Airport, Orlando Sanford International Airport, and Orlando Melbourne International Airport will end commercial passenger flights Saturday night, officials told ABC News. The Fort Lauderdale–Hollywood International Airport is currently under a hurricane warning and will be closed Saturday and Sunday. The Miami airport is directing anyone who is there but does not have a flight to its information counter, which is located in Concourse E on the second floor. The airport said on Twitter Friday it is "making arrangements to move passengers without flights to designated shelters." The Federal Emergency Management Agency is encouraging people in impacted areas to connect with family and friends via social media. But when that's not possible, they should use the American Red Cross' Safe and Well website, a free public reunification tool that allows individuals and organizations to register and post messages to indicate they are safe or to find loved ones. Registrations and searches can be done directly on the website. You can also register by texting SAFE to 78876. Messages can be sent and received in both English and Spanish. To speak directly with someone at the American Red Cross regarding a missing friend or relative, please contact 1-800-733-2767. 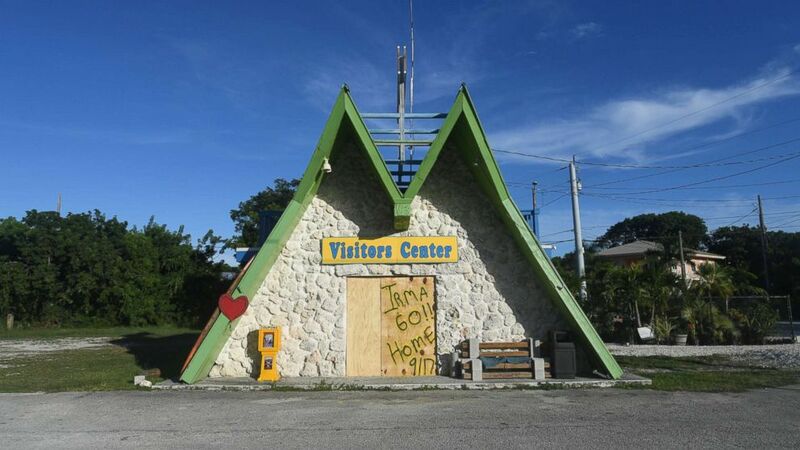 (Bryan Woolston/Reuters) A visitor center is closed and boarded in preparation for Hurricane Irma in Key Largo, Fla., Sept. 7, 2017. Meanwhile, the National Center for Missing and Exploited Children activated its National Emergency Child Locator Center at 1-866-908-9570. Be sure to indicate whether your missing child has a disability or has access or functional needs when making a report. Anyone who finds a child who may have been separated from parents or caregivers during Hurricane Irma should contact local police and enter basic information and a photo into the National Center for Missing and Exploited Children's Unaccompanied Minors Registry. For those who do not have internet access, the organization asks that they call 1-866-908-9570.